Welcome to Week #8 of the OCG 2017.10 format. Sorry for the delay in this week’s report. The results of the tournaments that were held on Thursday took quite some time to compile. 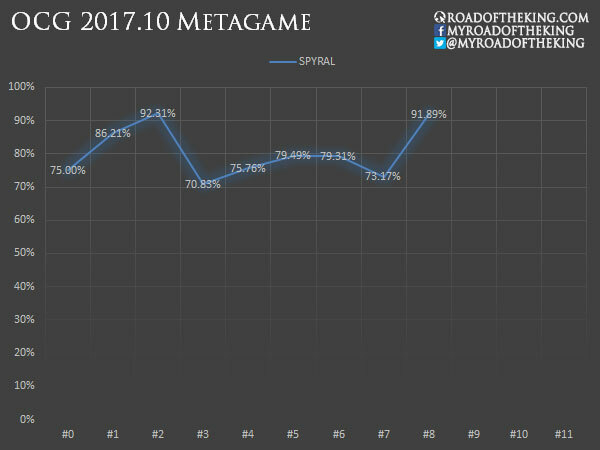 This report will cover 37 top-performing decks from 5 tournaments that were held in Japan, China and Taiwan during 19 – 23 November 2017. The Grinder SPYRAL deck featured this week seems a little counter-logic, but surprising the team that played this build performed quite well and even won the “60th Aichi CS”, a 3v3 team tournament which had 28 teams (84 players) participating. Yada Makoto “バコ” (5 – 8th in World Championship 2016) and “LinkLink” were in the same team and both were playing the exact same deck build. Yada Makoto went 5-1, while “LinkLink” went 4-1-1. The deck has been streamlined to focus only on the Grinder Golem combo, by cutting out 3 Machine Duplication, 1 SPYRAL GEAR – Drone and 1 SPYRAL MISSION – Rescue. Playing PSY-Framegear Gamma seems counter-intuitive, but compared to Ghost Reaper & Winter Cherries and Droll & Lock Bird, Gamma has a slight advantage of being potentially useful on your own turn when going first. Most importantly, Gamma ensures that One for One resolves successfully, and that is vital when Special Summoning Grinder Golem later on the same turn. Trickstar Light Stage in the Side Deck is also a tech that has been showing up occasionally. When going second, Gateway to Chaos is a terrible card to be drawing into, but to run Set Rotation, a third Field Spell Card with a different name is required. Trickstar Light Stage fulfills this purpose, but has an added advantage of not being a dead draw. The (2) effect could be used to bait out the opponent’s Trap Card such as SPYRAL GEAR – Utility Wire or Solemn Strike. However, do note that unlike Gateway to Chaos and Oracle of Zefra which has a mandatory effect on activation, Trickstar Light Stage has an optional effect. This means that the opponent can still activate Trickstar Light Stage, even if they do not have any Trickstar monsters in their deck. Many thanks to “LinkLink” (@LinkLink_opuct) for replying to my question and answering my doubts on Twitter. “Sakuma” (“さくま”) is the 3rd teammate of Yada Makoto and “LinkLink”. Using the same Main Deck but with a different Side Deck, he went 5-0-1. 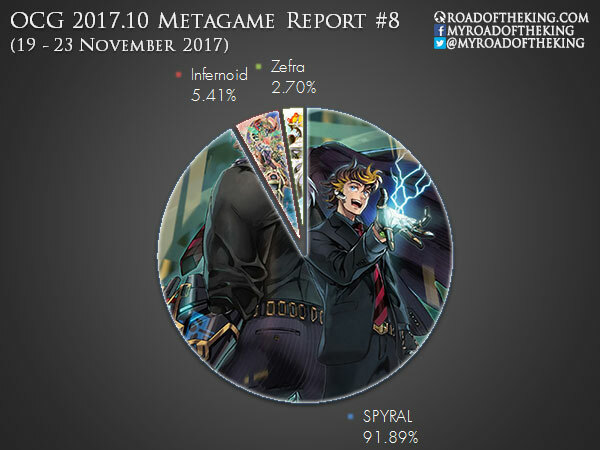 While Yada Makoto and “LinkLink” were hedging by running 3 Machine Duplication and 1 SPYRAL GEAR – Drone in the Side Deck, “Sakuma” did not and was essentially running the same Main Deck build throughout his games. 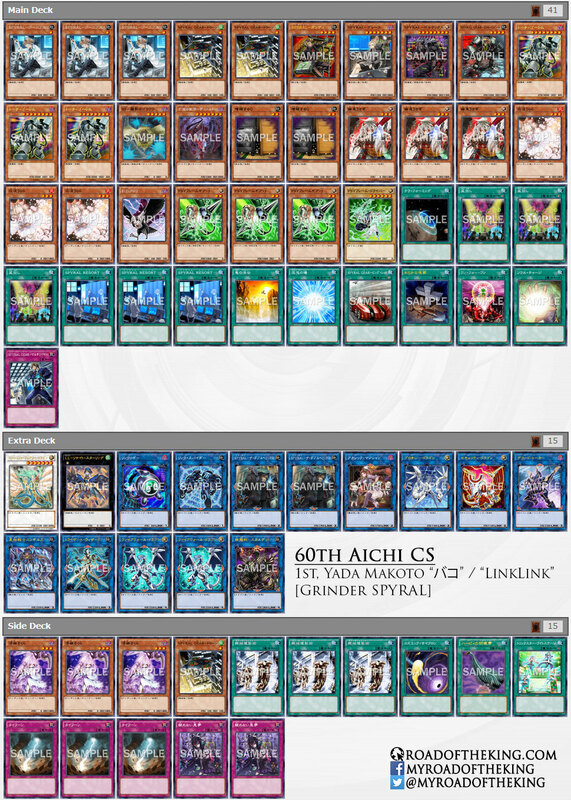 It is hard to tell if the Machine Duplication-less build is objectively a better version of Grinder SPYRAL since no other players were running this extreme build. But considering their team’s performance, this build is at least worth a second look. While the mono SPYRAL build has stabilised, the Grinder SPYRAL build is still being improved on as players continue to test out different experimental builds. it did actually. rouge decks are popping up because it’s not easy to deal with things you don’t know how to deal with. i.e – Ritual Beast / Burning Abyss and whatnot. In fact, skill drain BA is popping up more and more after Cherubini was dropped and that’s kinda cool! Is that the biggest Pie in the Meta? can you explain why they prefer using Typhoon to other S/T removal? and thanks for your in-depth reports. Typhoon is for the Zefra match-up. When the opponent place 2 Pendulum Scale, that would allow Typhoon to be played from hand. So Typhoon could be used to disrupt the opponent’s Pendulum play even if they go first.